...that the Cabal in the Solar System represent only a fraction of their vast interstellar empire? ...that Fenchurch Everis has claimed that the inside of the Traveler smells of vanilla? "That shriek, that wicked laugh. If you listen closely, you can hear power in its song." 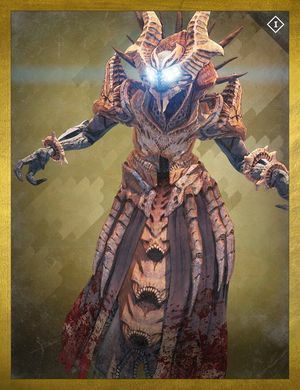 Omnigul, Will of Crota is an Ascendant Hive Wizard and the consort of the Hive god Crota; she is also the mother and acting leader of the Spawn of Crota. She acts as the secondary antagonist for The Dark Below campaign, where she led the Hive sect's efforts in bringing Crota back to the material realm and raise an army to invade the City; both efforts were thwarted and she finally met her end by a fireteam of Guardians. In The Dawning she had briefly "undone" her death to continue her work only to fail yet again. Twice, the player foils Omnigul's plans, yet she escapes. The first time is in Fist of Crota, where she's encountered during a battle between Hive and Fallen. The second time is during Siege of the Warmind, where the player foils her attempt to seize control of Rasputin. Omnigul is finally killed in the Will of Crota Strike when she's cornered in the Jovian Complex. Omnigul is the only Wizard with an Arc shield instead of a Solar shield. She can summon Hive and casts poison with greater frequency. Unlike normal Wizards, Omnigul fires her Darkness Blasts faster and more accurately than normal. However, unlike any other Ultra class enemies, she can be blinded by flashbang grenades, Ward of Dawn with the Helm of Saint-14 equipped, and the Purifier Robes. Omnigul makes a return as the final boss of the Revisited version of the strike. Just like last time, she will stay in the center of the arena and suppress Guardians with her rapid fire Darkness Blasts as well as cast poison clouds for area denial. However, she will have locked the door that Guardians would normally run through for cover, trapping the players inside for the duration of the fight. The room will eventually get filled with a toxic gas that drastically slows the movement of any player that steps in it. Whenever reinforcements arrive, she will teleport away from the arena until all the reinforcements are dead. This will repeat until she herself is killed for good. The prefix "Omni" is Latin for "all" or "every", while the suffix "gul" stands for rose in Persian and Turkish languages. Gul in Swedish, Danish, and Norwegian also means yellow. Essentially, Omnigul is the "All-yellow/All-rose". The implications this has for Thorn and Necrochasm are enormous, as Xyor, the Unwed is a Wizard belonging to the Spawn of Crota. "Ġūl" is also Arabic for "ghoul," thus "Omnigul" may be interpreted as "all-ghoul" or "over-ghoul". The voice actor for Eris Morn also did Omnigul, in addition to generic Hive. Omnigul is known as the "Old Witch of Cuba" by the Destiny community due to a misname, and quickly became a memetic joke. Omnigul is the only Major in the game that is a Strike boss, as she can be blinded by Flashbangs, Suppressors, Envenomed Smoke bombs, Saint-14-empowered Defender shields, Eidolon Ally, Abyss Defiant, and other disorientation or crowd-control Guardian gear. Omnigul in the "Will of Crota" strike.